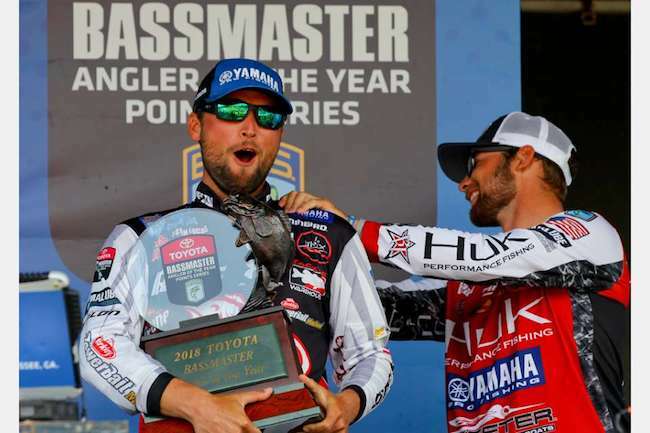 Technically, James Elam won the Toyota Bassmaster Angler of the Year Championship on Lake Chatuge, but Justin Lucas was the big winner. Lucas finished seventh, which solidified his first Angler of the Year title, as he bested runner-up Josh Bertrand, who actually opted not to fish the final day due to the arrival of his second child any day. Along with becoming the 23rd angler to every be AOY in the 50-year history of Bassmaster, Lucas’ tournament was all that much sweeter that he utilized a Berkley Cane Walker – a lure of his own design – to catch the majority of his fish. Obviously, it’s been quite the season for Lucas, but was it good enough to bump him into the top 10? Surprisingly, no. Well, not yet, at least. Lucas has a brutal start to his 2017 season (his finishes were 100th, 85th and 78th). Any one of those is enough to hold a pro back from the top 10. So three is a killer to his average, but that only makes it all that much more impressive he’s sitting in 11th right now. Shows just how well he’s fished since his slow start last year. Meanwhile, as we said, Elam actually bested the field of top 35 anglers with a three-day weight of 48-8. And while he didn’t win AOY, his victory was enough to jump him back into the top 10, as he now sits in eighth. Now, here comes the hard part: Bertrand. As we said, he intentionally didn’t finish for what most would consider a very valid reason. However, his “finish” still counts, and that unfortunately tanks his ranking. He was ranked sixth going into the Championship. Now? He’s all the way back in 18th. Of course, many pros would love to be sitting in 18th, but still, it’s one of those unfortunate circumstances that can happen in sports. It’s also worth mentioning the Rookie of the Year award went to North Carolina pro Jake Whitaker, who finished 15th in the tournament and barely edged Arizona angler Roy Hawk for the title. Though, neither angler yet qualifies for our two-year ranking.